Watch the demo competition live on Finnish national TV! 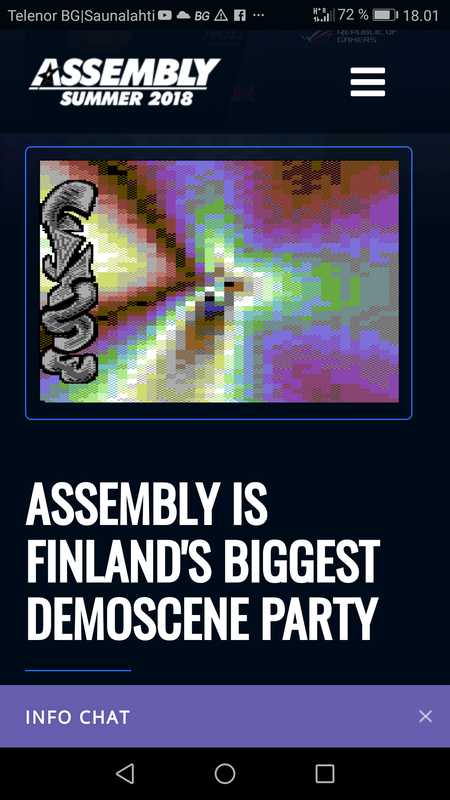 The legendary Assembly demo competition will be shown live on national (Finnish) YLE TV2 channel on Saturday August 4 starting around midnight after the ROG Tournament CS:GO Finnish Championship 2018 Finals. You can view event also on-line: AssemblyTV hosts interviews, chats and of course the compostudios throughout the party at twitch.tv/AssemblyTV. You can also watch AssemblyTV’s latest videos on Youtube. Demoscene is the art of real-time: the combined talents of programmers, musicians and graphics artists resulting in amazing audiovisual shows, demos, that run in real time on your computer. See some of the best works ever released in the ASSEMBLY Archive. Assembly Summer 2018 Demo competition entry, 2nd place.